Selim Aga Incidents Connected with the Life of Selim Aga, a Native of Central Africa. 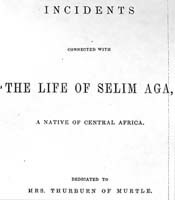 Incidents Connected with the Life of Selim Aga, a Native of Central Africa. [Aberdeen, UK]: [Published for the Author, W. Bennett, Printer], . Slaves -- Africa -- Biography.